The land near the intersection Hagar and Coolidge drives will be the location for a new Family Student Housing community and a new childcare facility. The UC Board of Regents have approved two major projects that are aimed at improving the student experience at UC Santa Cruz by offering more campus housing options and revitalizing aging facilities. Last month, the Board of Regents approved the renewal of Kresge College and Student Housing West. 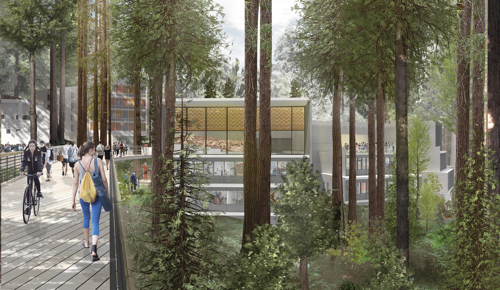 Both projects are focused on supporting the needs of current UC Santa Cruz students. The Kresge College renewal aims to update the residential college through a mix of new construction and renovation to meet the needs of today’s student body. The college was constructed in 1973. Student Housing West will create 3,072 new beds at two sites, one along Heller Drive, the other along Hagar Drive. Additionally, it will provide a new childcare facility that will be able to extend service to the children of faculty and staff, in addition to students. The campus published final environmental impact reports for both the Kresge and Student Housing West projects at the end of February. Of Kresge’s 21 existing buildings, 11 will be renovated and rebuilt. Others will be removed to make way for new viewsheds, commons, gathering spaces, and accessibility features, including a “stramp” (a hybrid staircase and ramp) for improved accessibility. Buildings will be renovated to help the campus group together different services offered through the college. Plans for the north section of the Kresge campus would include new and larger residence hall accommodations; a new academic plaza and academic facility; the Kresge provost’s offices and classrooms, including a 600-seat lecture hall, which would become the largest of its kind on campus; a 150-seat lecture hall; and 50- and 35-seat classrooms. A 48-seat computing lab is also included. The plan to build at the two sites—along Heller and at the intersection of Hagar and Coolidge—has been identified as the approach that will develop additional housing in a timely fashion, incorporate adequate support space for students and residential life staff, minimize displacement impacts on students with families, and provide affordable housing, which is particularly important given that the ultimate cost of building and maintaining housing is borne by students. The Hagar site would be home to a new childcare facility that will serve the children of faculty and staff in addition to students, as well as 140 units for Family Student Housing. While the committee expressed broad support for the project as a whole, some referenced correspondence from members of the UC Santa Cruz community opposing development on part of the campus’s East Meadow, while others—citing the pressing need for more housing in campus—voiced strong support for the proposal as it stands now. Blumenthal pointed out that campus administration, in addition to the seven alternatives previously introduced, also considered five additional alternative proposals since the Regents meeting in January. None of which meet all the project objectives. He said the cheapest alternative would add millions of dollars to the project cost, and that increase would be reflected in higher rental fees for students, which is inconsistent with the objective of supporting “the development of sufficient and affordable, on-campus student housing under the UC President’s Housing Initiative.” Moreover, many of the alternatives also failed to provide on-campus housing in a timely fashion and minimize displacement impacts on students with families. Though UC Santa Cruz provides housing for 9,300 students—roughly half of its student body—there remains an urgent need for affordable campus housing, especially for upper-division students who otherwise would be living in the surrounding community. 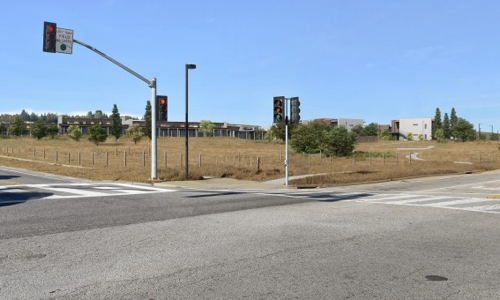 Student Housing West is the single largest housing project underway in Santa Cruz County. Regents also had a discussion of the campus’s plan to rebuild University House and Event Center and asked the campus to find a way to significantly reduce the project’s cost.